With the San Diego Reader Reporting that Imperial Beach is Proceeding With Litigation over Cross Border Sewage Flow and calls for the resignation of IBWC Commissioner Edward Drusina, Dig Imperial Beach asked IB City Council Member Ed Spriggs, who also co-chairs the IBWC Citizens Forum, for his perspective on these issues. Dig Imperial Beach: The SD Reader has reported that the City is proceeding with litigation over the problem of the cross border sewage flow from Tijuana into Imperial Beach, what can you tell us about it? Ed Spriggs: Imperial Beach City Council is not committed to any one course of action but is exploring all options to achieve a full and complete solution to the almost continuous flow of sewage across the border. At last month's City Council Meeting I proposed an amendment the City's "State of Emergency" resolution on the cross border sewage problem, expanding it to include examination of all options. That amendment was approved unanimously and this is the course we are following. Dig Imperial Beach: But is the City planning to file some form of legal action as noted in the Reader piece? Ed Spriggs: The City Council’s decisions on our chosen course or courses of action will be announced publically at the appropriate time. Dig Imperial Beach: As co-chair of the IBWC Citizens Forum what do you think about the mayor's suggestion that IBWC Commissioner Edward Drusina Resign? Ed Spriggs: I fully understand the mayor's frustration with the IBWC, especially in light of the March 2nd and June 1st Citizens Forum meetings, which were both attended by large numbers of irate citizens rightfully concerned about the cross border sewage flows. As a result, I called upon both IBWC Commissioner Drusina and his Mexican counterpart Roberto Salmon to each take a much stronger leadership role within their governments to solve this problem. 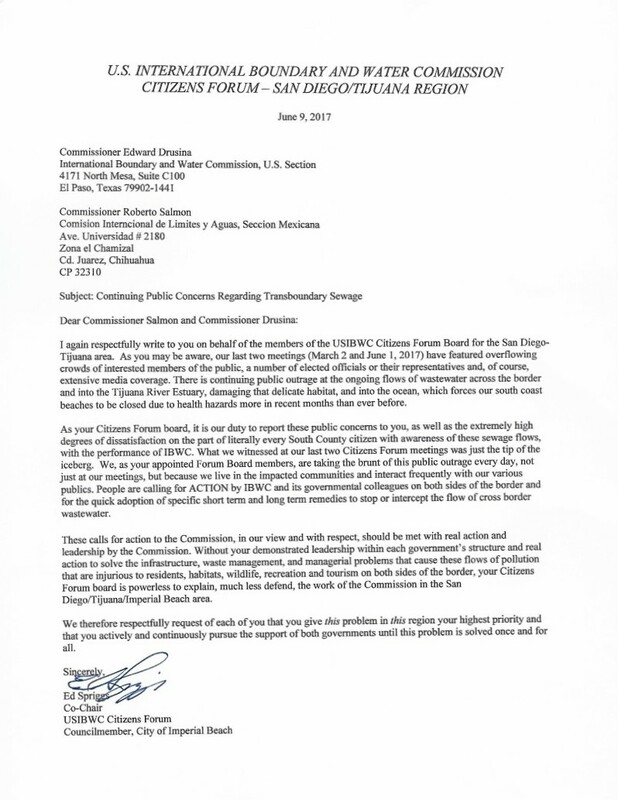 Although the IBWC is responsible for the entire US -- Mexico border, including California, Arizona, New Mexico and Texas, my letter urged the Commissioners to make this problem in this area their number one priority! I think it would be useful for your readers to see the actual text of the letter.